A Russian warship in the Mediterranean reportedly tracked down and followed a ‘stealthy’ US nuclear-powered submarine. The incident took place in April, the month the US, UK, and France launched airstrikes against Syria. The frigate Admiral Essen of the Russian Black Sea Fleet managed to track down one of the Ohio-class submarines currently in service with the US Navy, Izvestia newspaper revealed on Friday, citing a source in the Russian Navy. The Russian ship left Sevastopol, a major Black Sea port located on the Crimean Peninsula, on March 13 and returned on June 30. The frigate was deployed most of the time in the Mediterranean Sea. The pursuit lasted more than two hours, during which the Russian ship recorded the basic parameters of the American submarine, which will be deciphered and added to the acoustic characteristics of the submarine. Izvestia said the USS Georgia, a cruise missile submarine, was the one that might have been tracked by the Russian Navy. Even locating a submarine in the sea is a great success, Vladimir Ambartsumyan, who once served as a commander on the naval brigade within the Russian Northern Fleet, told Izvestia. “Nuclear submarines are complex objects for detection,” he told the paper. The US Navy hasn’t yet released any comments on the report. The incident took place in April, the month the US, UK, and France bombed Syria in retaliation for an alleged chemical attack by the Assad government in the town of Douma. Syrian air defense systems intercepted the majority of cruise missiles and air-surface missiles from the US-led allies. The Admiral Essen, which carries eight vertically-launched Kalibr cruise missiles, is one of Russia’s most modern warships. 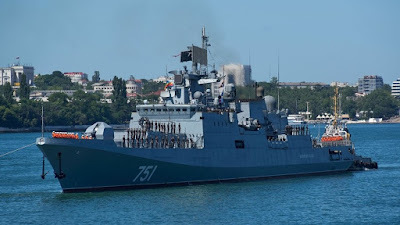 The frigate was deployed to strike Islamic State (IS, formerly ISIS) targets during the Russian operation in Syria in 2017. The warship successfully struck ISIS command and control centers, as well as ammunition depots on several occasions.